Are you trying to lose weight? Many people today are on some type of calorie counting system, in an attempt to lose excess weight or to just stay in shape. If you need help counting the calories you burn each day, then you will find a very helpful free spreadsheet tool to use. 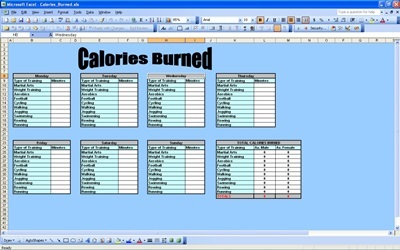 The free Calories Burned Calculator is just one of many spreadsheets you will find to help you to lose weight. Keeping track of the calories you burn each day, while exercising, is paramount in your ability to lose the excess weight you don’t want. This spreadsheet tool makes keeping track of your physical activities easy. All you have to do is simply enter the number of minutes every day you spend in each of the exercises you do, or enter the number of minutes you want to reach, to lose weight. The spreadsheet will allow you to see how many minutes a day you are engaging in during your exercise activities and then calculates the total number of calories you’ve burned. The total number is displayed in the corresponding columns. It is important to know how many calories you are burning each day. This spreadsheet calculator, which allows you to see the number of calories you’ve burned each day, actually helps people to meet their daily calorie burning goals. Consistent exercising, and burning calories, is the key ingredient to any healthy weight lose program. And, when used along with other helpful spreadsheets, such as the Calorie Counter Calculator, the Weight Loss Tracker, the Ideal Weight Calculator and the Nutribar Weight Loss Tracker, anyone can lose weight. The free Calories Burned Calculator spreadsheet can be downloaded right here. There are many other useful spreadsheets you will discover at Exceltemplates.net. This is a website dedicated to offering free Excel templates for both Windows and Mac OS systems.